New Brunswick (French: Nouveau-Brunswick; [nuvobʁɔnzwɪk]) is one of Canada's three Maritime provinces (together with Prince Edward Island and Nova Scotia) and is the only constitutionally bilingual (English–French) province. The principal cities are Fredericton, the capital, Greater Moncton, currently the largest metropolitan (CMA) area and the most populous city, and the port city of Saint John, which was the first incorporated city in Canada and largest in the province for 231 years until 2016. In the Canada 2016 Census, Statistics Canada estimated the provincial population to have been 747,101, down very slightly from 751,171 in 2011, on an area of almost 73,000 km2. The majority of the population is English-speaking of Anglo and Celtic heritage, but there is also a large Francophone minority (31%), chiefly of Acadian origin. It was created as a result of the partitioning of the British colony of Nova Scotia in 1784 with the capital in Saint John before being moved up river. The name 'New Brunswick' was chosen by King George III despite local recommendations for the name to be 'New Ireland'. The provincial flag features a ship superimposed on a yellow background with a yellow lion passant guardant on red pennon above it. The province is named after the city of Braunschweig, located in modern-day Lower Saxony in northern Germany and known in English and Low German (the language originally spoken in that area of Germany) as Brunswick, and also after the former duchy of the same name. The then-colony was named in 1784 to honour the reigning British monarch, George III, who was concurrently Duke and prince-elector of Brunswick-Lüneburg ("Hanover") in the Holy Roman Empire. The original First Nations inhabitants of the area that would become New Brunswick were members of three distinct (but related) tribes. The largest tribe was the Mi'kmaq, and they occupied the eastern and coastal areas of the province. They were responsible for the Augustine Mound, a burial ground built about 800 BCE near Metepnákiaq (Red Bank First Nation). The western portion of the province was the traditional home of the Wolastoqiyik (Maliseet) people. The smaller Passamaquoddy tribe occupied lands in the southwest of the province. Although it is possible that Vikings may have reached as far south as New Brunswick, the first known European exploration of New Brunswick was that of French explorer Jacques Cartier in 1534, who discovered and named the Bay of Chaleur. The next French contact was in 1604, when a party led by Pierre du Gua de Monts and Samuel de Champlain set up camp for the winter on St. Croix Island, between present-day New Brunswick and Maine. The colony relocated the following year across the Bay of Fundy to Port Royal, Nova Scotia. Over the next 150 years, a number of other French settlements and seigneuries were founded in the area occupied by present-day New Brunswick, including along the Saint John River, the upper Bay of Fundy region, in the Tantramar Marshes at Beaubassin, and finally at St. Pierre (site of present-day Bathurst). The whole maritime region (and parts of Maine) was at that time claimed by France and was designated as the colony of Acadia. 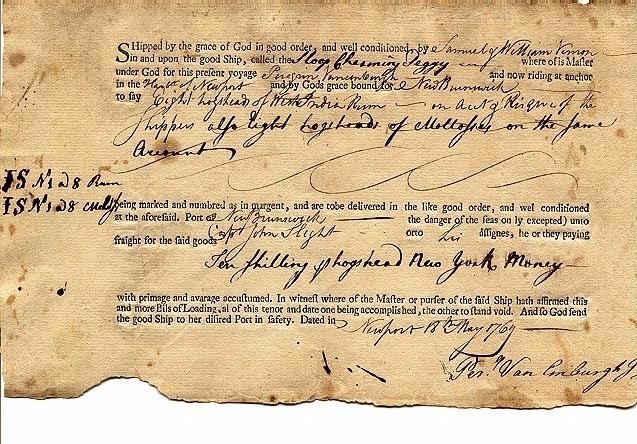 One of the provisions of the Treaty of Utrecht of 1713 was the surrender of Acadia (or Nova Scotia as it was called by the British) to Queen Anne. The bulk of the Acadian population thus found themselves residing in the new British colony of Nova Scotia. The remainder of Acadia (including the New Brunswick region) was only lightly populated and the two European powers contended over this ill-defined territory. The Maliseet from their headquarters at Meductic on the Saint John River, participated with the French in numerous guerilla raids and battles against New England during Father Rale's War and King William's War. About 1750, to protect his interests in New France, Louis XV caused three forts (Fort Beauséjour, Fort Menagoueche and Fort Gaspareaux) to be built along the Isthmus of Chignecto. This caused what is known to historians as Father Le Loutre's War, because of the contended possession which had been in issue since before 1713. A major French fortification, the Fortress of Louisbourg, was also built on Île Royale (now Cape Breton Island) after Queen Anne's War, but the function of this fort was mostly to defend the approaches to the colony of Canada, not the lost province of Acadia. During the French and Indian War (1754–63), the British completed their displacement of the Acadians over all of present-day New Brunswick because they took up arms against them, when they had been requested repeatedly for decades not to do so. Fort Beauséjour (near Sackville), Fort Menagoueche and Fort Gaspareaux were captured with casualties on both sides by a British force commanded by Lt. Col. Robert Monckton in 1755. Inside Fort Beauséjour, the British forces found not only French regular troops, but also Acadian irregulars. Governor Charles Lawrence of Nova Scotia used the discovery of Acadians helping in the defence of the fort to order the expulsion of the Acadian population from Nova Scotia. The Acadians of the recently captured Beaubassin and Petitcodiac regions were included in the expulsion order. Some of the Acadians in the Petitcodiac and Memramcook region escaped, and under the leadership of Joseph Broussard continued to conduct guerrilla action against the British forces for a couple of years. Other actions in the war included British expeditions up the Saint John River in the St. John River Campaign. Fort Anne (Fredericton) fell during the 1759 campaign, and following this, the legal de jure status of Utretcht was settled and confirmed de facto by the Treaty of Paris 1763. After the Seven Years' War, most of present-day New Brunswick (and parts of Maine) were confirmed as part of the colony of Nova Scotia and designated as Sunbury County. New Brunswick's relatively isolated location on the Bay of Fundy, away from the Atlantic coastline proper tended to discourage settlement during the postwar period. There were exceptions however, such as the coming of New England Planters to the Sackville region and the arrival of Pennsylvania Dutch settlers in Moncton in 1766. In both these cases, many of the new settlers took up land that had originally belonged to displaced Acadians before the deportation. There were several actions on New Brunswick soil during the American Revolutionary War: the Maugerville Rebellion (1776), the Battle of Fort Cumberland (1776), the Siege of Saint John (1777) and the Battle at Miramichi (1779). The Battle of Fort Cumberland was the largest and most significant of these conflicts. Following the war, significant population growth finally came to the area, when 14,000 Loyalists, having lost the war, came from the newly created United States, arriving on the Saint John River in 1783. Influential Loyalists such as Harvard-educated Edward Winslow saw themselves as the natural leaders of their community and that they should be recognized for their rank and that their loyalty deserved special compensation. However they were not appreciated by the pre-loyalist population in Nova Scotia. As Colonel Thomas Dundas wrote from Saint John, "They [the loyalists] have experienced every possible injury from the old inhabitants of Nova Scotia." Therefore, 55 prominent merchants and professionals petitioned for 5,000-acre (20 km2) grants each. Winslow pressed for the creation of a "Loyalist colony" – an asylum that could become "the envy of the American states". Nova Scotia was therefore partitioned. In 1784, Britain split the colony of Nova Scotia into three separate colonies: New Brunswick, Cape Breton Island, and present-day peninsular Nova Scotia, in addition to the adjacent colonies of St. John's Island (renamed Prince Edward Island in 1798) and Newfoundland. The colony of New Brunswick was established as a separate province by an Order-in-Council in Great Britain the 18th June 1784; Sir Thomas Carleton was appointed as Lieutenant-Governor on 3 August 1784, and in 1785 a new legislative assembly was established with the first elections. The new colony was almost called New Ireland after a failed attempt to establish a colony of that name in Maine during the war. The province later gained control over its crown lands in 1837. Even though the bulk of the Loyalist population was located in Parrtown (Saint John), the decision was made by the colonial authorities to place the new colonial capital at St. Anne's Point (Fredericton), about 150 km up the Saint John River as it was felt that by placing the capital inland, it would be less vulnerable to American attack. The University of New Brunswick was founded at Fredericton at the same time (1785), making it the oldest English-language university in Canada and the first public university in North America. Local government at a rural level was accomplished through a county and parish structure, and the power to tax for the purpose of primary education was first granted by the province to the parishes in 1802. Grammar schools at the parish level followed in 1805 and again in 1816. 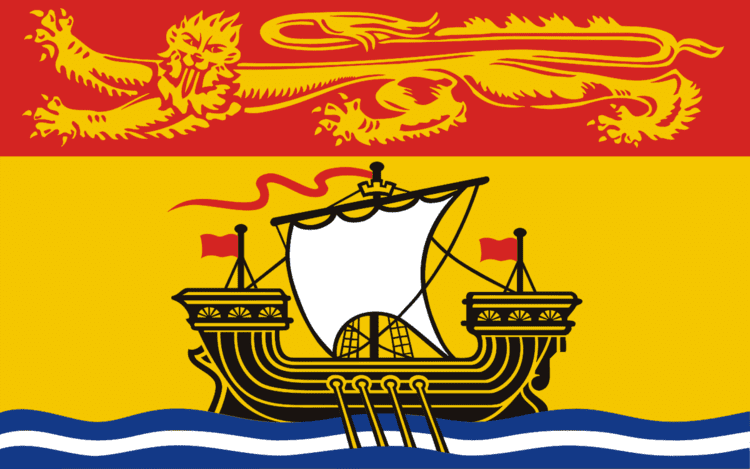 The New Brunswick and Nova Scotia Land Company, a means of transferring land held by the Crown to individual owners, was chartered in New Brunswick in 1831. Financed by shares sold in England, this company purchased large areas of Canadian land at low prices, promising to develop roads, mills and towns. Although the province was largely rural, the colony, prior to the middle of the century, was not self-sufficient in wheat or flour and imports were thus necessary. In fact, Governor Douglas saw a silver lining in the great 1825 Miramichi Fire; he is recorded to have declared that the fire had positive aspects, in that it cleared the forest so that residents might dedicate themselves to farming, instead of relying on the sale of timber in order to purchase imported foodstuffs. Throughout the mid 19th century, shipbuilding on the Bay of Fundy shore, on the Petitcodiac River, at Chatham on the Miramichi River, and at Bathurst in the Bay of Chaleur, became a dominant industry in New Brunswick. The Marco Polo, a clipper ship holding the round-trip speed record between Liverpool and Australia, was launched from Saint John in 1851. The Cunard family began to flourish here at that time. Resource-based industries such as logging and farming were also important components of the New Brunswick economy during this time and railways were constructed throughout the province to serve them and link the rural communities. In his History of New Brunswick, Hannay observes that "The system of county government was as bad as possible, because the magistrates were not responsible to any person. The condition of the county accounts was never made public, and it was not until a comparatively late period in the history of the province that the Grand Jury obtained legislative authority to inspect the county accounts," and by 1877 an act providing for compulsory municipal incorporation was put in force. The province entered Confederation with a Legislative Council of 40 members holding their seats for life, a Legislative Assembly of 40 members and an Executive Council of nine members. Under its powers of changing the provincial constitution the Legislative Council was abolished by an act passed on April 16, 1891. As the 20th century dawned, the province's economy again began to expand. Manufacturing gained strength with the construction of textile mills such as the St. Croix Cotton Mill; and in the crucial forestry sector, the sawmills that had dotted inland sections of the province gave way to larger pulp and paper mills. The railway industry, meanwhile, provided for growth and prosperity in the Moncton region. Nevertheless, unemployment remained high throughout the province, and the Great Depression brought another setback. Two influential families, the Irvings and the McCains, emerged from the Depression to begin to modernise and vertically integrate the provincial economy—especially in the vital forestry, food processing, and energy sectors. In the mid-1960s, forestry practices changed from the controlled harvests of a commodity to the cultivation of the forests. New Brunswick changed from more than two-thirds rural before 1941 to predominantly urban by 1971. Education and health care were poorly funded, and in the 1940s and 1950s the rates of illiteracy and infant mortality were among the highest in Canada. During the period 1950–1980, 80% of New Brunswick's small farms disappeared, as the agroindustry took root. The Acadians in northern New Brunswick had long been geographically and linguistically isolated from the more numerous English speakers, who lived in the south of the province. The population of French origin grew dramatically after Confederation, from about 16 per cent in 1871 to 24 per cent in 1901 and 34 per cent in 1931. Government services were often not available in French, and the infrastructure in predominantly Francophone areas was noticeably less developed than in the rest of the province; this changed with the election of Premier Louis Robichaud in 1960. He embarked on the ambitious Equal Opportunity Plan, in which education, rural road maintenance, and health care fell under the sole jurisdiction of a provincial government that insisted on equal coverage throughout the province. County councils were abolished, and the rural areas came under direct provincial jurisdiction. The 1969 Official Languages Act made French an official language. New Brunswick is bordered on the north by Quebec's Gaspé Peninsula and by Chaleur Bay. The eastern boundary is formed by the Gulf of Saint Lawrence and Northumberland Strait. The southeast corner of the province is connected to the Nova Scotia peninsula by the narrow Isthmus of Chignecto. 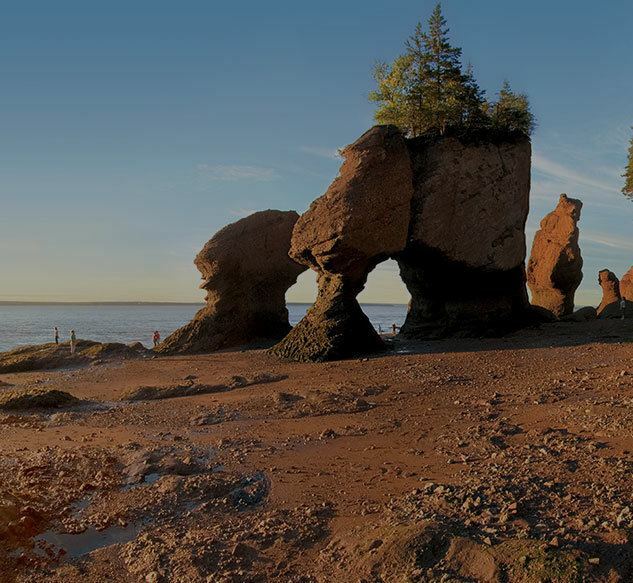 The south of the province is bounded by the Bay of Fundy coast, (which with a rise of 16 m (52 ft), has amongst the highest tides in the world). The US state of Maine forms the western boundary. New Brunswick differs from the other Maritime provinces physiographically, climatologically, and ethnoculturally. Both Nova Scotia and Prince Edward Island are either surrounded by, or are almost completely surrounded by water. Oceanic effects therefore tend to define their climate, economy, and culture. On the other hand, New Brunswick, although having a significant seacoast, is sheltered from the Atlantic Ocean proper and has a large interior that is removed from oceanic influences. As a result, the climate tends to be more continental in character than maritime. The major river systems of the province include the St. Croix River, Saint John River, Kennebecasis River, Petitcodiac River, Magaguadavic River, Miramichi River, Nepisiguit River, and the Restigouche River. Although smaller, the Bouctouche River, Richibucto River and Kouchibouguac River are also important. The settlement patterns and the economy of New Brunswick are based more on the province's river systems than its seacoasts. Because of this, New Brunswick's population centres tend to be less 'centralized' than in Prince Edward Island and Nova Scotia. Fredericton, Saint John, and Moncton all sit on rivers that have played a significant role in their economic history. The total land and water area of the province is 72,908 km2 (28,150 sq mi), over 80 percent of which is forested. Agricultural lands are found mostly in the upper Saint John River valley, with lesser amounts of farmland in the southeast of the province, especially in the Kennebecasis and Petitcodiac river valleys. The three major urban centres are all in the southern third of the province. New Brunswick has a humid continental climate all over the province, with slightly milder winters on the Gulf of St. Lawrence coastline. The far north of the province is just above subarctic with very cold winters. Winters are colder than those being found in Nova Scotia all over the province due to the greater continental influence. Summers are often warm, sometimes hot. First Nations in New Brunswick include the Mi'kmaq and Maliseet (Wolastoqiyik). The first European settlers, the Acadians, are today descendants of survivors of the Great Expulsion (1755), which drove thousands of French residents into exile in North America, Britain, and France for refusing to take an oath of allegiance to King George III during the Seven Years' War (French and Indian War). Acadians who were deported to Louisiana are often referred to as Cajuns in English. Much of the English Canadian population of New Brunswick is descended from Loyalists who fled the American Revolution, including a considerable number of Black Loyalists. Indeed, their arrival was the impetus for the creation of the colony. This is commemorated in the province's motto, Spem reduxit ("hope restored"). There is also a significant population with Irish ancestry, especially in Saint John and the Miramichi Valley. People of Scottish descent are scattered throughout the province, with higher concentrations in the Miramichi and in Campbellton. In the 2001 Canadian census, the most commonly reported ethnicities were 193,470 French (26.9%); 165,235 English (23.0%); 135,835 Irish (18.9%); 127,635 Scottish (17.7%); 27,490 German (3.8%); 26,220 Acadians (3.6%); 23,815 "North American Indian" (First Nations) (3.3%); 17,024 Asian Canadian (2.0%), 13,355 Dutch (Netherlands) (1.9%); and 7,620 Welsh (1.1%). It should be noted that 242,220 people (33.7%) identified themselves as simply "Canadian" or "Canadien," while 173,585 (24.1%) also selected another ethnicity—for a total of 415,810 (57.8%) calling themselves Canadian. Each person could choose more than one ethnicity. The population of the province since 1851 has been documented by various government agencies, and is provided here below in tabular format. The urban-rural split has been, since 1951, roughly even, whereas previously the province had been largely rural. Since 1971, the year in which the overall Canadian rural population fell below 25%, the province has been an outlier in this statistical category, along with the other Atlantic provinces. New Brunswick is Canada's only officially bilingual province, and it is the only province where both official language communities are heavily represented, with Anglophone New Brunswickers making up roughly two-thirds of the population, and the Acadien or Francophone New Brunswicker population representing over 30% of the population (people whose mother tongue is an officially recognized First Nations languages or non-official language together make up about 2% of New Brunswickers). As a comparison, the minority language communities of Ontario and Quebec (Franco-Ontarians and Anglophone Quebeckers respectively) make up less than 10% of those provinces' populations. With both official language communities so strongly represented, New Brunswick is home to both French and English language hospitals and healthcare networks, school systems, universities, and media. The province also has a relatively high proportion of people who state that they can speak both official languages, with about 246,000 people, or 33.2% of the population reporting the ability to speak both English and French (though Francophones make up two-thirds of those who are bilingual). The province's bilingual status is enshrined in both provincial and federal law. The Canadian Constitution makes specific mention of New Brunswick's bilingual status and defines the spirit of implementation as one based on both community and individual rights (in contrast with the constitutional protections for the other provinces that is limited to individuals, though this extends to "community" issues in terms of provision of schooling etc.). The Canadian Charter of Rights and Freedoms has a number of New Brunswick specific articles and makes specific mention of New Brunswick in each section relating to language (ex. Section 18 has two paragraphs, the first regarding bilingual publication of the Canadian Parliaments work and laws, the second specifying that New Brunswick's legislature will publish its work in both French and English). Of particular interest is Article 16.1, which declares that the French and English speaking communities of New Brunswick have equal rights and privileges, including community specific educational and cultural institutions. This specific distinction of linguistic community is important in that it recognizes not only the rights of individuals to use their language, but also demands that the two official language communities have their specific institutions upheld. In 2012, New Brunswick francophones scored lower on the Programme for the International Assessment of Adult Competencies than their anglophone counterparts in New Brunswick. The US is the province's largest export market, accounting for 92% of a foreign trade valued in 2014 at C$12.964 billion. Refined petroleum accounted in 2014 for 63% of the total, followed by seafood products, pulp, paper and sawmill products and non-metallic minerals (chiefly potash). Heavy metals, including lead and zinc, are mined in the north around Bathurst, but the area has largely been mined out: the Brunswick Mine's massive sulphide orebody was discovered in 1953, opened in 1964 and employed more than 2,000 people at its peak, but closed in April 2013. One of the world's largest potash deposits is located in Sussex. Two mines exist there, named Penobsiquis and Picadilly, the latter of which cost over two billion dollars since 2008 and ceased operations in 2016. Some of the laid-off workers were given opportunities in Saskatchewan. Oil and natural gas deposits are also being developed in the Sussex region. Farming is concentrated in the upper Saint John River valley (in the northwest portion of the province), where the most valuable crop is potatoes. Mixed and dairy farms are found elsewhere, but especially in the southeast, concentrated in the Kennebecasis and Petitcodiac river valleys. New Brunswick was in 2015 the biggest producer of wild blueberries in Canada, with the rural (northern) Acadian region a major contributor to the total revenue of over $39 million. Maple syrup and sugar products earned New Brunswick's 191 farmers over $30 million gross in 2014. The most valuable seafood catches are lobster, scallops and snow crab. The farming of Atlantic salmon in the Passamaquoddy Bay region is an important local industry. The largest employers in the province are the Irving group of companies, several large multinational forest companies, the government of New Brunswick, and the McCain Foods group of companies. In the 2014–15 fiscal year, provincial debt reached $12.2 billion or 37.7 per cent of nominal GDP. This represented a significant increase over the $10.1 billion recorded in 2011–12, when provincial debt was 32.2 per cent of provincial GDP. Although the province has a Fiscal Responsibility and Balanced Budget Act, the governments of Shawn Graham and David Alward both ran large deficits to place their constituents in a precarious position. The Auditor-General compared the public finances of the province unfavourably with both Manitoba and Saskatchewan in 2013. New Brunswick's debt-to-GDP ratio is projected to reach 41.9% in fiscal year 2017–2018, compared to a ratio of 25% in 2007–2008. New Brunswick since 1891 has had a unicameral legislature, with 49 seats contested in the 2014 election. Elections are held at least every five years, but may be called at any time by the Lieutenant Governor (the viceregal representative) on consultation with the Premier. The Premier is the leader of the party that holds the most seats in the legislature. Since 1960, the province has tended to elect a succession of young bilingual leaders. Former Premier Bernard Lord (Progressive Conservative) once was touted as a potential leader of the Conservative Party of Canada. Frank McKenna (premier, 1987–97), had been considered the Liberal Party of Canada leadership material. Richard Hatfield (premier, 1970–87) played an active role in the patriation of the Canadian constitution and creation of the Canadian Charter of Rights and Freedoms. Louis Robichaud (premier, 1960–70) was responsible for a wide range of social reforms. On September 21, 2014, the Liberal Party won the provincial election making 32-year-old Brian Gallant the new Premier. He replaced Progressive Conservative David Alward. The Liberals won 27 seats (before recounts), the Conservatives won 21, and the Green Party won its first seat. The judicial system in New Brunswick, which is now governed by the Judicature Act and its regulations, is similar to that in most other provinces with the exception of Quebec. The system consists of eight Judicial Districts, loosely based on the counties. Courts exist in three streams: the court of Queen's Bench, the Probate court, and the Provincial court. The Probate Court deals with matters involving wills and estates of deceased persons, while the Provincial court is the entry point for all persons charged with offences under the Criminal Code or other federal or provincial legislation. The Court of Queen’s Bench hears all matters within the domain of family law, and also has original jurisdiction in major civil and criminal cases. In addition, it has appellate jurisdiction over summary conviction offences from the Provincial Court. Criminal cases, at the defendant's option, can be tried by a jury or by a judge alone. Civil cases are similarly disposed. The Court of Appeal of New Brunswick, which sits in Fredericton, hears appeals from the inferior courts, as well as various administrative tribunals. The Chief Justice of New Brunswick, currently the Honourable J. Ernest Drapeau, serves at the apex of this court structure. In addition, the Chief Justice chairs the committee tasked with recommending Order of New Brunswick recipients. In New Brunswick, search warrants are issued only by judges of the Provincial Court because, while the Criminal Code provides that search warrants may be issued by a justice of the peace or a Provincial Court judge, there are no justices of the peace in New Brunswick. By the Hatfield government's passage of an Act to Repeal the Justices of the Peace Act (1984 S.N.B. c.27) the position of “justice of the peace” was abolished in the province. This is unique as being unlike the other jurisdictions in Canada, all of which had retained as of 2004 and still function with the position of justice of the peace. The province devolves certain of its powers and taxation to local units under the Municipalities Act. The government of these units is renewed by election, now quadrennial, through the Municipal Elections Act. New Brunswick is the eighth-most populous province in Canada with 751,171 residents as of the 2011 Census. It is the third-smallest in land area at approximately 71,400 km2 (27,600 sq mi). New Brunswick's 107 municipalities cover only 8.6% of the province's land mass but are home to 65.3% of its population. The three most populous municipalities, which together composed as of 2016 slightly over one quarter of the province's population, are presented below. Moncton was, in 2014, the largest urban centre and fastest growing metropolitan area in the province and is among the top ten fastest growing urban areas in Canada. The 2016 census indicates that Moncton's population rose by 4.1 per cent to 71,889 from 69,074 in 2011, while Saint John's population decreased by 3.6 per cent, from 70,063 to 67,575. The city's economy is principally based on the transportation, distribution, information technology, commercial, and retail sectors. Moncton has a sizeable Francophone Acadian minority population (35%) and became officially bilingual in 2002. Since the city's transition to bilingualism, Moncton has experienced an upsurge in French in-migration from elsewhere in the province. The depopulation of the Acadian Peninsula and other areas in Northern New Brunswick are partially a result of French New Brunswickers seeking new opportunities in urban centres like Moncton and its sister city, Dieppe. Saint John is a historic city and popular port of call. The Port City is the oldest in the country and until recently was the largest in the province. The city is one of the busiest shipping ports in Canada in terms of gross tonnage. Saint John has become a major energy hub for the East Coast. It is the home of Canada's biggest oil refinery and an LNG terminal has also been constructed in the city. In addition, the public owns large oil-fired and nuclear power plants, which are located in or near the city. Due to recent prosperity, the retail, commercial, and residential sectors are currently experiencing a resurgence. The Moosehead Brewery is located in the west side of the city. Saint John is a maritime city both in terms of its culture and traditional industries like fishing and shipbuilding. Saint John is a city of predominantly Celtic heritage making its cultural experience akin to cities in Nova Scotia. Saint John has a growing tech sector surrounding the downtown (locally called uptown) and University of New Brunswick. Fredericton, the capital of the province, is home to the Beaverbrook Art Gallery, the University of New Brunswick, and St. Thomas University. One of Canada's largest military bases, CFB Gagetown, is located near suburban Oromocto; which is situated just east of Fredericton. The economy of Fredericton is intimately tied to the governmental, military, and university sectors. Fredericton is also one of the few urban centres in Atlantic Canada that sits significantly far inland (c. 100 km), making its city-scape unique to the region. After the 1966 abolition by Louis Robichaud of the elected County Council level of government, municipalities were constrained to deposit their refuse nearby, as the municipalities were unable to own property outside their jurisdiction. This led to unsanitary conditions in several locations, and over time the dumps became full. This fact led to a realization that regional service delivery needed to be reinvented. The Regional Service Delivery Act of 2012, which was introduced by Minister of Local Government Bruce Fitch, created bodies corporate that regulate regional planning and solid waste disposal, and provide fora for discussion on a regional level of police and emergency services and regional sport, recreational and cultural facilities. The commissions are populated by the mayors of each municipality or rural community within a region. In October 2016, controversy erupted over a $40-million theatre production facility for Fredericton, because smaller municipalities in the region were not convinced that they wanted to fund the albatross. Public education in the province is administered by the Department of Education, a department of the Government of New Brunswick, according to a forest of legislation because of segmentation by age and purpose. Private education, apprenticeships and occupational training in the province are also strictly regulated, to the extent that it constitutes a provincial offence to offer courses with no licence. The New Brunswick Community College system has campuses in all regions of the province. Although they are legislated separately by official language, this comprehensive trade school system offers roughly parallel programs in various campuses. Anglophone students from the northern part of the province must travel south to obtain education, whereas Francophone students have no courses offered in the southwest. Each campus, however, tends to have areas of concentration to allow for specialization. There are also a number of private colleges for specialized training in the province, such as the Moncton Flight College, one of the top pilot-training academies in Canada. There are four publicly funded secular universities and four private degree-granting institutions with religious affiliation in the province. The two comprehensive provincial universities are the University of New Brunswick and the Université de Moncton. These institutions have extensive postgraduate programs and Schools of Law. Medical education programs have also been established at both the Université de Moncton and at UNBSJ in Saint John (although affiliated with Université de Sherbrooke and Dalhousie University respectively). Mount Allison University in Sackville is currently ranked as the best undergraduate liberal arts university in Canada and has produced 51 Rhodes Scholars, more than any other liberal arts university in the Commonwealth. One of the greatest celebrated holidays in New Brunswick is Canada Day. This is because New Brunswick was one of the first four provinces of Confederation, joining on July 1, 1867. Another holiday that is of great importance is New Brunswick Day which is on the first Monday of August and has been celebrated annually since 1976. This statutory holiday gives the people of New Brunswick an opportunity to celebrate their provinces's history, culture, natural beauty, and community relations. Families can enjoy large meals, entertainment, and other fun activities together. In French-speaking New Brunswick, it would not be until the 1960s that a comparable institution was founded, the Université de Moncton. Then, a cultural renaissance occurred under the influence of Acadian historians and such teachers as Claude Roussel and through coffeehouses, music, and protest. An outpouring of Acadian art, literature, and music has pressed on unabated since that time. Popular exponents of modern Acadian literature and music include Antonine Maillet, Édith Butler and France Daigle. A recent New Brunswick Lieutenant-Governor, Herménégilde Chiasson, was a poet. In northwest New Brunswick and neighbouring Quebec and northern Maine, a separate French-speaking group, the Brayon, have fostered such important artists as Roch Voisine and Lenny Breau. (See also "Music of New Brunswick) Dr. John Clarence Webster and Max Aitken, 1st Baron Beaverbrook have made important endowments to provincial museums. Dr. Webster gave his art collection to the New Brunswick Museum in 1934, thereby endowing the museum with one of its greatest assets, James Barry's Death of General Wolfe, which ranks as a Canadian national treasure. Courtesy of Lord Beaverbrook, the Beaverbrook Art Gallery in Fredericton has a collection of world-renowned art, including works by Salvador Dalí and J. M. W. Turner. The 1930s were an important period for New Brunswick culture, with artists such as Jack Humphrey and Miller Brittain coming to prominence. The nationally renowned poet and painter P. K. Page spent the decade in Saint John, which also saw the arrival of Danish ceramicists Kjeld and Erica Deichmann, who introduced pottery as a serious art form. In modern literature, writers Alfred Bailey and Alden Nowlan dominated the New Brunswick literary scene in the last third of the 20th century and world-renowned literary critic Northrop Frye was influenced by his upbringing in Moncton. The annual Frye Festival in that city celebrates his legacy. The expatriate British poet John Thompson, who settled outside Sackville, proved influential in his short-lived career. Douglas Lochhead and K. V. Johansen are other prominent writers living in the town of Sackville. David Adams Richards, born in the Miramichi, has become a well-respected Governor-General's Award-winning author. Canadian novelist, story-writer, biographer and poet, Raymond Fraser, grew up in Chatham and lives now in Fredericton and award-winning Irish author and poet Gerard Beirne now lives in Fredericton and is a professor at The University of New Brunswick. Atlantic Ballet Theatre of Canada, based in Moncton and featuring Russian and European trained dancers, has recently flourished and has started touring both nationally and internationally. Symphony New Brunswick, based in Saint John, also tours extensively in the province. 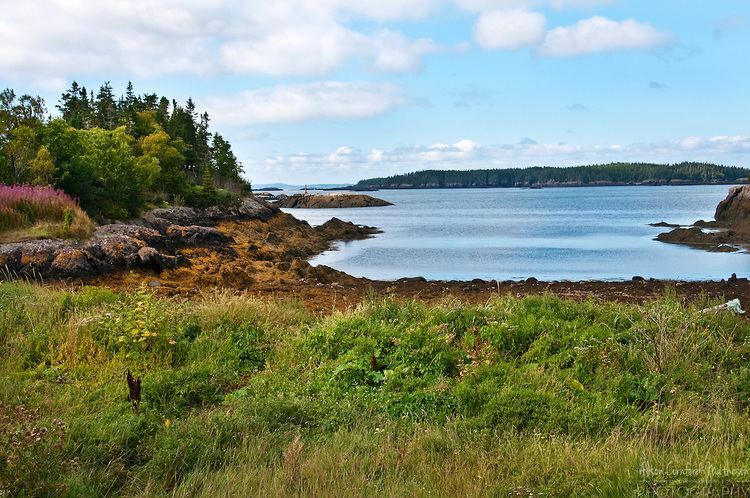 New Brunswick differs culturally from Prince Edward Island and Nova Scotia in a number of ways. Because of the provinces's sizeable French speaking population, French-Canadian culture (specifically Acadian) permeates many parts of New Brunswick society. Likewise, New Brunswick's proximity to the United States affects the everyday life of people that live close to the 'line'. New Brunswick shares more border crossings with the US State of Maine than any other Province/State share in North America. Furthermore, the well-known Maritime dialect so recognizable in Nova Scotia and PEI becomes 'watered down' the further west (and north) you move in the Province. While some areas, like Saint John, strongly share in the Maritime cultural experience, a number of population centres in New Brunswick have more in common with communities in Maine than they do with Halifax or Charlottetown. 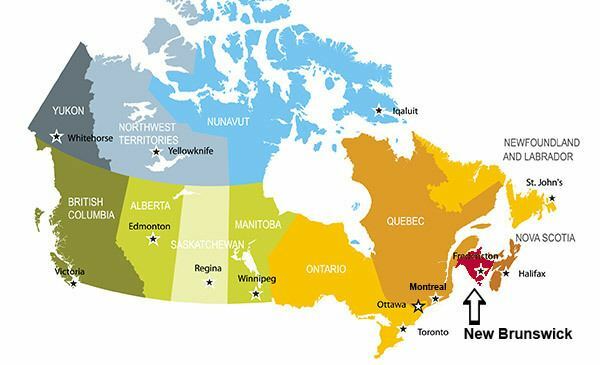 New Brunswick has been coined by many as Canada's 'Drive-thru Province.' While this title is used in jest, there is truth behind the fact that the sheer distances between major population centres in New Brunswick do a lot to transform culture from place to place. Despite being within the same provincial boundaries, Moncton, Saint John, and Fredericton differ culturally, economically, and geographically in significant ways. Aside from Saint John's large tourism industry from cruise ships, some of the province's tourist attractions include the New Brunswick Museum, Minister's Island, the Beaverbrook Art Gallery, Grand Manan Island, Kings Landing Historical Settlement, Village Historique Acadien, Les Jardins de la République, Hopewell Rocks, La Dune de Bouctouche, Saint John Reversing Falls, Magnetic Hill and the Magnetic Hill Zoo, Magic Mountain, Casino New Brunswick, Cape Jourimain National Wildlife Preserve, Sackville Waterfowl Park, and the 41 km (25 mi) Fundy Hiking Trail.